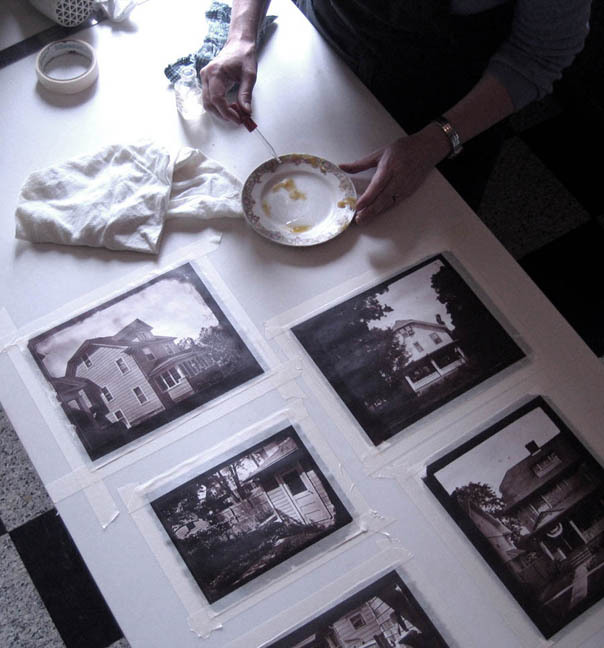 WHAT IS A SALT PRINT? The salt or silver solution can be applied by brushing, or by floating the paper on the solution. 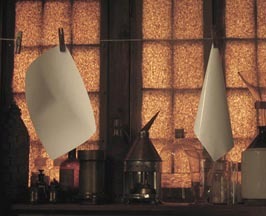 The paper must be dried after each application, by hanging it, placing it in a drying box (or with a hairdryer). The sensitized paper is then placed in direct contact with a negative in a printing frame and exposed to light. The image then visibly "prints-out." When ready, the print is removed from the printing frame and washed in salted water, fixed and washed again. Some photographers also gold-tone their salt prints. This step takes place after the initial wash, before fixing. as beeswax and oil of lavendar. 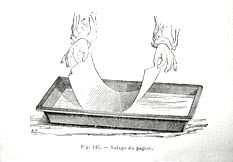 The technique of making salted paper prints dates back to the earliest days of photography. In 1802 Thomas Wedgewood and Humphrey Davy used silver chloride to make printed out images on paper. They did not, however, discover a way to secure these prints permanently. Several years later, Nicefore Niepce also made prints on paper using the same process, before his investigations into the light sensitivity of asphaltum. William Henry Fox Talbot experimented with the proportions of silver nitrate and chloride to establish the most effective combinations for printing out images, by contact and in the camera obscura. 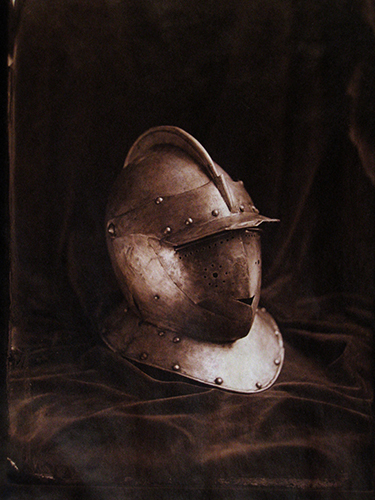 At this time Talbot discovered that an excess of chloride made the paper less sensitive to light and used this effect to stabilize his prints. In addition to chlorides, Talbot also used potassium bromide and potassium iodide for print stabilization. 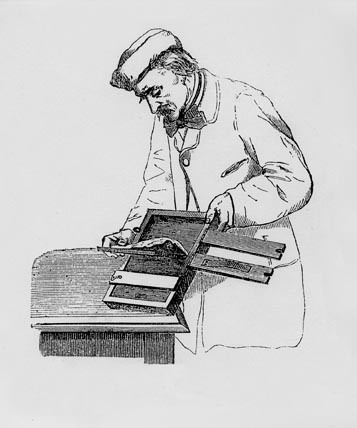 When Sir John Hershel suggested the use of sodium hyposulfite (sodium thiosulfate) as a more efficient fixing agent, the salted paper print had “arrived.” After the invention of the albumen print in 1850 by Blanquart-Evrard, the salted paper print was referred to as simply a “plain” print. In 1850, John A. Whipple and William B. Jones, of Boston, obtained a patent for the “Crystalotype,” a particular type of albumen on glass process. Later, Crystalotype was used by Whipple to describe salt prints produced from albumen negatives, and eventually, extended to salt prints from collodion negatives. The term is used here to differentiate an untoned salt print made from a glass negative, as opposed to one made from a calotype or waxed paper negative. All images and text © 2009 Scully & Osterman and may not be used without permission.